It all started in June 1960, when Torontonians Murray and Marvelle Koffler visited an outdoor art fair in New York City. On their return home, they were shocked to hear that two artists had been removed from Toronto City Hall for attempting to sell their work on city property. Working with the former Director of the National Gallery of Canada, Alan Jarvis, and Jack Pollock, the Kofflers created the first Toronto Outdoor Art Exhibition in June 1961. In 1967, the show moved from the Four Seasons Moter-Hotel’s parking lot and garden, to City Hall Square where it remains today. After 50 successful years, it is the largest outdoor art exhibition in Canada with over 100,000 people attending every year. This year our very own Marilyn Lightstone will have some of her paintings on display. 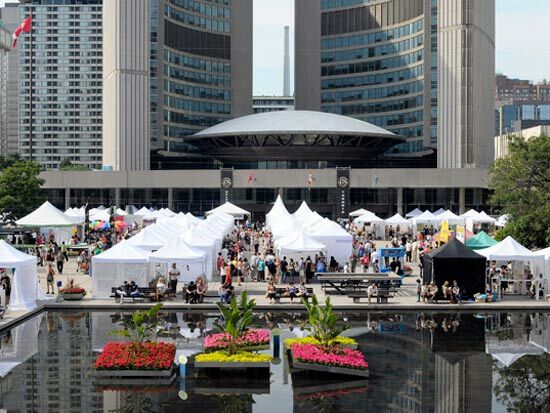 The Toronto Outdoor Art Exhibition runs from July 6th to 8th at Nathan Phillips Square. Be sure to visit Ms. Ligthstone’s booth, number 190, in the Turquoise Section . Admission is free. For more information visit torontooutdoorart.org. The Toronto Outdoor Art Exhibition presented by The New Classical 96.3 FM, Toronto’s only all classical station.